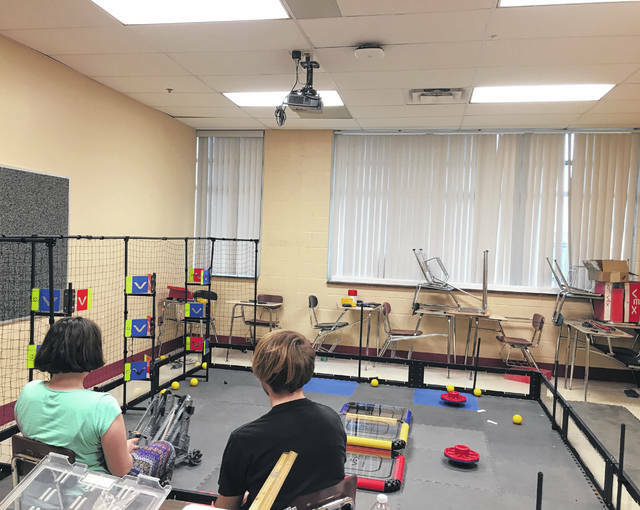 During the PATCH open house, the robotics class will have their VEX Robotics competition robot with them, so individuals will be able to see how it works when its on the field. POINT PLEASANT — Area local schools have implemented an enrichment program giving students an opportunity to learn a new skill outside of their academic studies. Keri Black, Point Pleasant Junior/Senior High School PATCH coordinator/secretary, shared Point Pleasant Junior/Senior High School (PPJ/SHS) will be having an open house showcasing its PATCH program courses during a home basketball game on Tuesday, Feb. 19 from 4-6 p.m. PATCH is a federal program/grant through the West Virginia Department of Education. The PATCH courses on display along with the class’ demonstrations will be the robotics class, the sewing class, and the diamond painting class. The robotics class will have their VEX Robotics competition robot with them, so individuals will be able to see how it works when its on the field. When speaking with the Register, two middle school students involved in the robotics PATCH class shared why they joined the program. One student said he was new to PPJ/SHS this year and was encouraged to join by a staff member. After being in the class for awhile, he came to realize how much he enjoyed it and decided to stay with it. Another student said she joined because she was encouraged by a friend. Also, the thought of being able to create a robot through her imagination and see it perform tasks by itself was interesting to her. In addition, though the theater program is not a part of PATCH, the theater students will have a display of what they are currently working on, their upcoming shows, as well as material from their past shows. Along with PPJ/SHS, Point Pleasant Intermediate School, Beale Elementary School, and New Haven Elementary School also participate in the PATCH program. Black said this program gives students an opportunity to learn a new skill and gives them enough time to enjoy and have fun while learning it. The staff and students involved in PATCH have a goal to complete a community service project and host a family night with a special guest speaker during each session. The PATCH session for PPJ/SHS will be changing in March wherein classes will be added and/or taken away. PATCH is held after school for PPJ/SHS students for approximately two hours on Monday-Thursday. Along with having time to focus on their extracurricular craft/activity, the students are also offered supplemental academic assistant as a math tutor is available to any student in need, according to Black. According to the PATCH21 website, this program currently serves 2,000 students in Roane, Jackson, and Mason counties, one-fifth of the total after school population in the state. The program also operates three preschools in Roane and Jackson Counties. PATCH administers several different grants that focus on character education, tobacco, drug, and alcohol prevention, civic duty and service learning, watershed and clean water awareness, entrepreneurial job skills, and leadership. The goal of the PATCH staff is to offer programs that children are excited to participate in as to maintain the students’ interest and involvement. PATCH offers a variety of 94 different educational enrichment programs across counties in West Virginia for grades pre K-12. Some information from patch21.org was used in this article.